This story is from Punch!, an app for the iPad which you can download for free here! The “Nyan Cat” video features a crude digital image of a cat with the body of a Pop Tart. It sails through outer space, leaving a rainbow trail in its wake, to the accompaniment of a Japanese pop tune, for three minutes and 37 seconds. Since it was uploaded to YouTube on April 5, 2011, it has logged more than 78 million views. 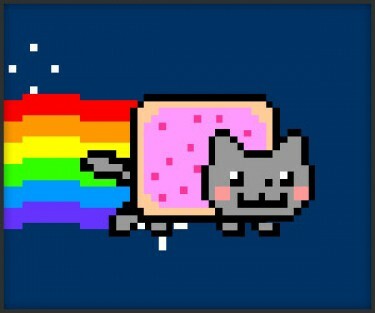 Mindless, repetitive, and catchy, “Nyan Cat” is a quintessential artifact of viral culture. While we may associate such phenomena with the digital age, virality has been around long before wi-fi. But the type of thing that bypassed the cultural gate-keepers and got passed around from person to person in the days before the internet was a lot different from the average 21st-century meme. Internet sharing favors the simple, the silly, the cute. Before the web, when cassettes and VHS tapes were the most easily shared technologies, the things that went viral were countercultural, naughty, or just plain strange. Washington D.C. residents Jeff Krulik and John Heyn had an early viral hit with an oddball 17-minute VHS tape, Heavy Metal Parking Lot. It resulted from their pointing a video camera at metal fans outside the Capital Centre in Landover, Maryland, before a 1986 Judas Priest concert (with Dökken as the opening act). Krulik and Heyn showed the humble result on public-access television and at a punk venue called DC Space, which led to a slot at the American Film Institute. Krulik’s follow-ups — Heavy Metal Picnic, Monster Truck Parking Lot, Neil Diamond Parking Lot, and Harry Potter Parking Lot — haven’t had quite the same impact of the original, which ended up having a 2003 theatrical release. In 2004, the Backstreet Boys paid homage to Heavy Metal Parking Lot with their video for “Just Want You to Know.” At roughly the same time, Krulik and Heyn created a Parking Lot TV show, which lasted eight episodes on Trio. Then the original video (along with bonus footage) had a 2006 DVD release. It has lived on partly thanks to Lady Gaga, who sponsored a YouTube series, “Lady Gaga’s Pop Culture Parking Lot,” during her Fame Ball tour. 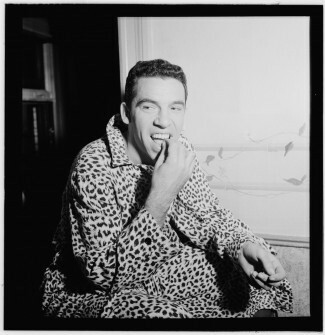 Long before Heavy Metal Parking Lot, touring musicians passed around bootleg cassettes filled with the rants of legendary jazz drummer and band leader Buddy Rich. The ill-tempered Rich was notorious for berating his musicians in blunt tirades — but unless you had been present for one of his verbal beat-downs, it was all just hearsay. When portable cassette players hit the market, disgruntled band members were at last able to make clandestine recordings of the boss in action. Distributed as third-generation dubs, the tapes got laughs from musicians and other interested parties for years to come. Late-era analog technology made it easier than ever for people to share cultural items without relying on professional distributors — but memes had managed to find a way to go from person to person without the help of cultural overlords for hundreds of years before that. It can even be argued that one of this country’s earliest viral works resulted in the American Revolution. In 1776 Thomas Paine anonymously published his 48-page Common Sense, which made the case for independence from British rule. He used plain language to get his point across. The pamphlet sold 120,000 copies in its first three months. Another American thinker who skipped past the gatekeepers was 20th-century journalist I.F. Stone, who had been a “Meet the Press” panelist and New York Post reporter until the McCarthy blacklist stopped him cold. Without a job, he channeled his impulses into a newsletter mimeographed in his garage, I.F. Stone’s Weekly, which found an audience of 70,000 likeminded thinkers. It was the most successful zine of the Atomic Age. Stone had been inspired by his predecessor, journalist George Seldes. Upset with The Chicago Tribune for defanging his reports on war-profiteering at the end of the 1920s, Seldes left the paper and created In Fact. The four-page, self-published weekly became a must-read in journalism circles. It went on to expose the link between cancer and smoking, and its circulation reached 176,000, although no major store would sell it. The campaign began to generate mantras like “Throw the Rascal In!” and “Offshore Oil Rights for North Dakota!” Chicago beatniks joined the Irwin cause, and an assemblage of 2,000 marched in Washington Square Park. 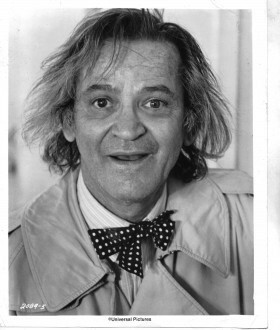 Corey scored cheers as he pledged to implement “socialized haircuts.” Police dispersed his supporters, and The Chicago American brandished Corey on its front page with a profile and photo spread. A more serious analog-era contender, Bill Clinton, made a name for himself among key constituents when a videotape of a campaign speech “went the 1992 version of viral,” writes Linda Hirshman in the book Victory: The Triumphant Gay Revolution. A videotape recording showed then-candidate Clinton at the Hollywood Palace, speaking passionately on the subject of AIDS discrimination. Almost immediately thereafter, Hirshman writes, “copies of the tape [were] circulating everywhere in the gay community,” and people were… watching the whole thing on the TVs in the gay bars.” An idea that defied mainstream political opinion had once again found a way to the public through viral means, rather than through the channels of official culture. Richard Dawkins coined the word “meme” in his 1976 book The Selfish Gene. “Memes propagate themselves in the meme pool by leaping from brain to brain via a process which, in the broad sense, can be called imitation,” he wrote. While early meme generators, from the sublime Thomas Paine to the ridiculous Irwin Corey, had sociopolitical critiques in mind, viral practitioners of the 1980s and 1990s tended to create stuff that was technically raw, obnoxious (if not simply antisocial), and completely at odds with the more shapely products turned out by mainstream cultural entities. Which brings us to Shut Up, Little Man!, the Jerky Boys, and the early version of South Park. Shut Up, Little Man! was a late-1980s phenomenon that came about when two gutter punks — known as Eddie Lee Sausage and Mitchell D. — recorded hours of the drunken arguments seeping through the thin walls of their apartment in San Francisco’s Lower Haight district. These recordings eventually made viral celebrities of their drunken neighbors, two unfortunates named Peter Haskett and Raymond Huffman. Peter: Shut up, little man! Peter: Shut up, little man! Shut up, little man! I don’t wanna see you cut your toenails… For god’s sake, shut up, little man! Eddie Lee Sausage sent a dub to a friend in New York as a gag gift. A dub of that dub made its way to Ohio. Soon, dubs were made of dubs of dubs and traded within a makeshift network, eventually falling into the hands of illustrators, playwrights, and musicians. Six years in, the San Francisco Weekly ran a profile on the ill-tempered neighbors. Even The New Yorker got in on the act, publishing an illustration of Raymond and Peter. Merchandise followed: T-shirts, comics, screen-savers. Matador Records put out a CD. The two men who couldn’t stop arguing died in the 1990s, but their words lived on: there was an indie film in 2002, called Shut Yer Dirty Little Mouth; and a documentary, Shut Up, Little Man! An Audio Misadventure, directed by Matthew Bate, which made the 2011 Sundance Film Festival. A similarly crude piece of amateur comedy went viral with the bootleg phenomenon of the Queens, New York-based Jerky Boys. The duo was made up of crank callers Johnny Brennan and Kamal Ahmed, who taped their hostile phone stunts in 1989. “I was working as a bouncer in a couple of hip spots in the Lower East Side,” Ahmed says. “I used to hand out tape recordings of our pranks, and that’s how they spread.” The grapevine led to that champion of the crude and the juvenile, Howard Stern, who played the Jerky Boys on his radio program. Soon enough Elektra Records put its stamp on the first official Jerky Boys album, which went double platinum. Throwing money at weak ideas is a Hollywood tradition. So it shouldn’t have been a surprise when Touchstone released Jerky Boys: The Movie, which flopped. More Jerky Boys albums followed. Once they were embraced by the mainstream, however, the two crank callers lost their friendship and, eventually, their popularity. A piece of analog-era viral culture with a more lasting success is “South Park,” the Comedy Central staple created by Matt Stone and Trey Parker. The rude cartoon got its start as a one-off short. Pooling $750, Stone and Parker scored big with footage created from glue, construction paper, and a Super 8. The result, Jesus vs. Frosty, was a hit at a 1992 University of Colorado student film festival. Today, looking at the prototype, with its inchoate incarnations of characters now culturally entrenched, you might feel like you’re viewing a YouTuber’s “South Park” knockoff. But it’s “South Park,” all right — just a version from an alternate, lo-fi universe. It begins with four boys building a snowman and singing. When they place a top hat on the snowman’s head, Frosty comes to life — and slays one of the boys (“Oh my God! Frosty killed Kenny!”). The surviving kids run to Santa Claus for help, only to discover that he’s Frosty in disguise. Ah, but the Baby Jesus comes to the rescue, slicing the hat from the snowman’s head using a razor sharp halo. The end. VHS copies of “Jesus vs. Frosty” flew around campus and made their way into the halls of 20th Century Fox. Fox executive Brian Graeden tracked down Parker and Stone and contracted them to make a “video Christmas card” for his industry pals. The resultant sequel, Jesus vs. Santa, enjoyed similar residual effect — but rather than becoming a hit among VHS-trading college kids, it went viral among Hollywood executives. At the same time, these proto-South Park episodes were uploaded to pre-YouTube sharing sites and became the first viral videos in internet history. Meaning that Santa vs. Frosty and its sequel form the bridge that connects the grimy era of analog virality to the catchy Nyan Cat culture of today.